Stephen Danforth was the pioneer in what has since become an important industry. In 1873, in connection with his son, Pitt F., he began the manufacture of sale clothing. The firm has ever been S. Danforth & son, Charles P Danforth becoming a member of (?) after the death of his brother Pitt in 1886. He was later succeeded by another brother John A., who is now in business with his father. They make an average of 30,000 pairs of pantaloons a year. H.P. Towle & Co. (George I. Philbrick) began manufacturing clothing in 1880, and carry on quite an extensive business, making up to 40,000 pairs of pantaloons per annum. This article of apparel is the only one produced here. The work is done for Boston firms who cut out the cloth and forward the unmade garments here to be made up. Orren E. Drake, son of Cyrus K. Drake, of Effingham, is one of the heaviest operators in the making of sale clothing. He established himself as manufacturer in Freedom in the spring of 1881. In 1888 he made up about 50,000 pairs of pantaloons and gave employment to about 400 sew-ers. David M. Allard commenced the pantaloons business in the fall of 1887. He makes from ten to fifteen thousand pairs a year. James D. Foster began the manufacture of pantaloons in 1886 and in the last year has made up about 25,000 pairs. Charles F. Danforth began business for himself on the west side of the bridge in 1888. He makes up about 20,000 pairs of trousers this year. Mercantile Houses. — The firm of B.P. Towle. & Co. (George I. Philbrick), general store, was established in September, 1879. The partners were natives of Freedom. The business had previously been carried on by B.P. Towle. This is the centre of commercial life in the Town. Th. this block is not only the store, which contains the extremely neat post office, but the Ossipee Valley Ten Cent Savings Bank and E.I Towle’s large manufacturing business. 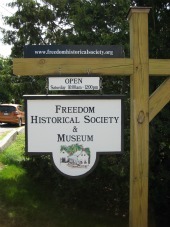 James D. Foster, born in Freedom, started a store for the sale of hard and tin ware, stoves, etc. in 1859. The business has attained quite a magnitude for a small town, and he has added agricultural machinery to his stock in later years. George F. Huckins, a descendant of the pioneer families of Lord and Huckins, a native of Effingham, has been in business as a general trader since 1884. He has been town clerk since March 1888. Orren E. Drake keeps an assortment of general merchandise for sale in connection with manufacturing.